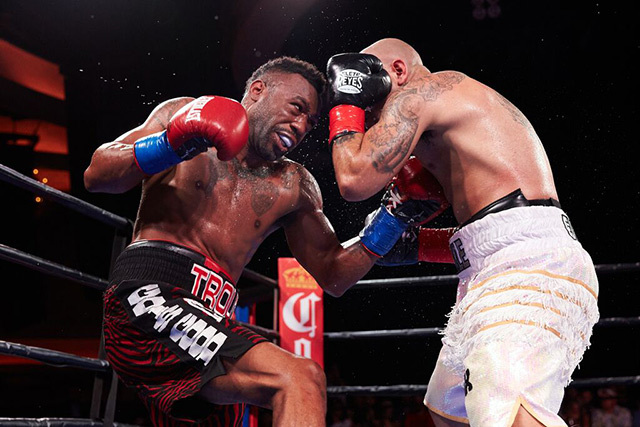 Austin Trout won his fourth consecutive fight, knocking out Joey Hernandez in the sixth round on Tuesday in the main event of the Premier Boxing Champions show on Fox Sports 1 from the Hollywood Palladium in Hollywood, California. Trout improved to 30-2 with his 17th knockout victory. "We got a good win with the knockout," said Trout in his postfight comments. Trout, who is working his way back up the junior middleweight ladder, challenged Julian Williams when he was asked who would be next after thanking those in attendance. "If you didn't come to watch me tonight, maybe you will come next time," Trout said. Williams, an undefeated 25-year old, struggled with Hernandez in a 10-round unanimous decision victory over Hernandez in April. Trout didn't need 10 rounds on Tuesday. Trout set up the victory with his jab in the early rounds, mixing in power shots in the third round. Trout connected on 101 of 333 punches thrown (30 percent) while the shorter Hernandez (24-4-1) landed 36 punches. Frustrated perhaps, the fight took an odd turn in the fourth round when Hernandez lifted Trout off the mat and threw him onto the canvas. Referee Jack Reiss immediately stopped the fight and penalized Hernandez one point for the round, but it wouldn't have made a difference. Two rounds later, the jabs and body shots started to take their toll. Trout dropped Hernandez with two vicious lefts to the body at the three-minute mark to end the fight. Tuesday was Trout's first fight since a knockout victory over Luis Galarza in May but it was the third straight fight Trout ended a fight early. He knocked out Galarza in the seventh round and the referee stopped his December 2014 fight against Luis Grajeda, also in the seventh round.